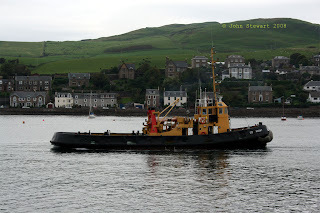 A rare sight in the lower Clyde these days, the veteran SD Husky (A178) is one of two remaining "Dog" Class tugs based at Faslane, the other being SD Spaniel. The "Dog" class, which originally comprised 20 vessels, were built between 1962 and 1972 for use as general harbour tugs. They displace 206 tons and have a 18.7 ton bollard pull. 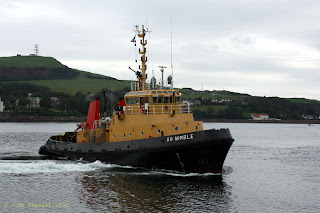 The 38.2 metre SD Nimble is one of nine Adept Class "twin unit tractors" in service with Serco Denholm. Built by Richard Dunston, Hessle and completed in 1985 she was originally based at Devonport. She displaces 450 tons and has a 28 ton bollard pull.